Y’all knew this was coming, right ;)? After I cut off 2 straggly inches in the back on my hair and an inch in the front (see here), I got a professional trim this past Friday. I got about an inch cut off of my longest lengths in the back and 1/2 an inch off of my shorter crown. The plan is to keep trimming the longest length every couple of months in order to keep it at the same length and in the hopes that the crown will catch up with it so I can get that full thickness waist length perimeter that I’ve been jockeying for since the CurlyNikki/Kim Coles GOC last year ;). 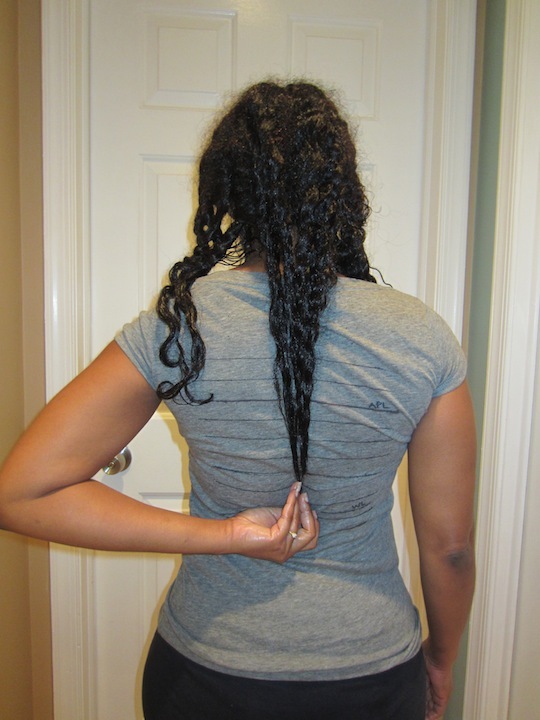 I also want to focus on protecting and growing my ultra fine (strand thickness and density) nape hair. Please excuse my oily, pre-pooed hair ;). I can’t believe that I allowed myself to get back here :(. I’m up 15 lbs, to 135 guys (can you see me sucking in my gut in those side poses? *lol* ;)). Yeah, I know … absolutely ridiculous. So, my goal is to lose 10-15 lbs by the time I go on vacation to Cancun this summer so I’m back at my fighting weight of 120-125 lbs. I have a couple of months to get ‘er done. This is the thing, I really need to find the work/home/exercise/blog balance. Over the last couple of months, my house has been an absolute mess. Paperwork piled on the buffet and kitchen table, dirty clothes falling out the hamper, clean and unfolded clothes piling out of the laundry basket, worn and discarded clothes covering every free surface except the bed, small birthday items lining the top of the couch, jewelry everywhere but the 3 jewelry cases in which it belongs … I could go on and on. It was bad. When that happens, I get stressed and become immobilized by inertia. I’ve failed to exercise, eat well, drink enough water and have not even taken my vitamins and supplements in months. I’ve allowed the blog to dominate the majority of my free time and keep me up until midnight or later most nights, resulting in my complete exhaustion almost every day of the week. Now, y’all know I love you guys! But, this has got to stop. So, in order to ensure that I am exercising most days of the week and maintaining an orderly and clean household, my blog posts will become less frequent. I still plan on posting at least once each week day … maybe even twice on a good day. But, the 3-4 posts a day is not gonna happen (except today! LOL!). I need to slow down for the sake of my own health and well-being!! LOL!! This is why there were no posts on Sunday or Monday. Wei and I spent almost 9 hours cleaning the house and there is still all of the laundry to do! It was major spring cleaning though and my mind heaved a sigh of relief!! I needed this to get myself mentally and physically prepared to get back on my A-game!! Yesterday was Day 1 … again!! LOL!! Pre-poo and finger detangle dry hair with Vatika oil (minimum of 30 min.). 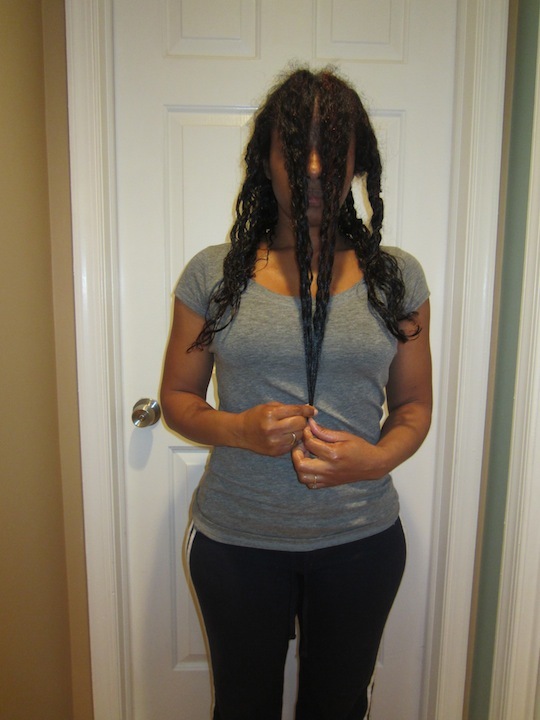 Braid or twist pre-pooed and detangled hair in 4-8 sections. 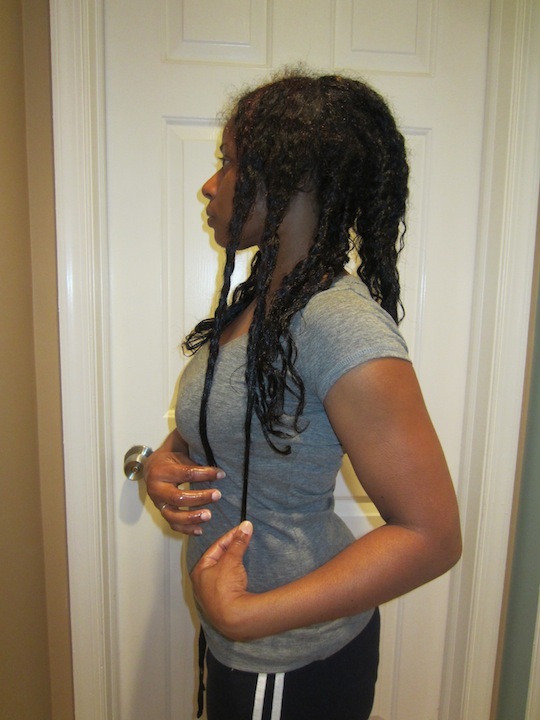 Shampoo hair in braids with DevaCare No Poo. Condition and finger detangle further with Herbal Essences Hello Hydration (HE HH). Use “Cool and Seal” DC technique. 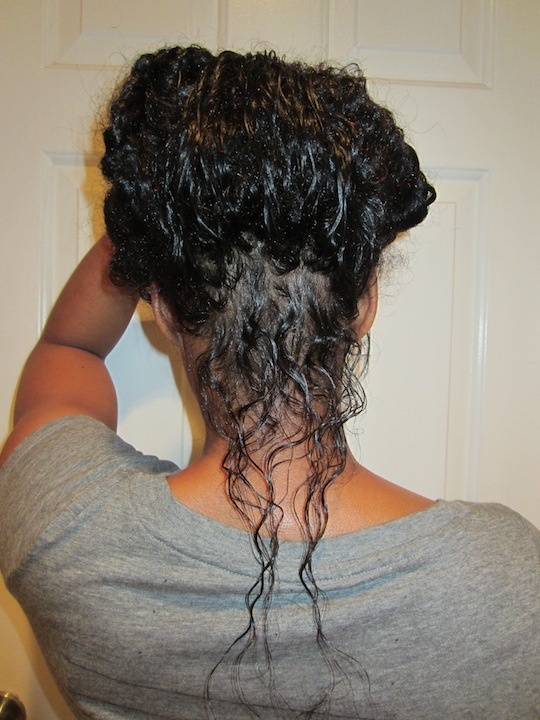 Blot with Curls Like Us Curl Cloth and allow hair to dry until only slightly damp. Apply leave-in (modified Kimmaytube recipe). 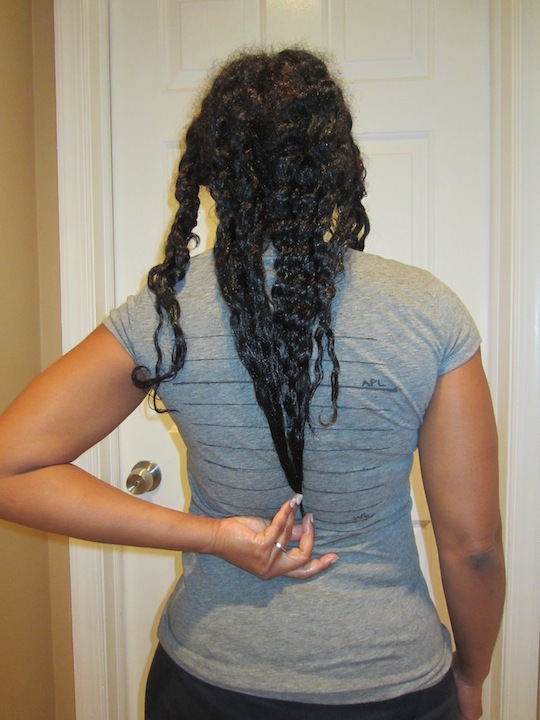 WnG or TnC to stretch hair (products vary). Wear hair out for 1-2 days. Use a mild protein treatment (ApHogee 2 Minute Keratin Reconstructor), as needed (probably every other wash days). Two step henna/indigo (roots only application). Clarify with Terressentials Mud Wash (TMW), bentonite clay mask (working on a homemade TMW recipe!) or a diluted sulfate shampoo. Do a heavy duty protein treatment (ApHogee 2 Step Protein Treatment). This is dependent on the acquisition of a hard bonnet dryer (I may hit Sally’s this week to pick up one I saw on sale for $99). Massage scalp with EO mix, sunflower oil (to decrease shedding – more on this soon) and/or Wild Growth Oil (I purchased the light this past weekend, but may exchange it for the original formula). I will start the mornings right by eating breakfast and doing Abs of Steel. I will put on my gear immediately upon arriving home from work and exercise. I will not write any posts until after I work-out. The Biggest Loser Cardio Max 6 Week Maximum Results Program (4 days a week). 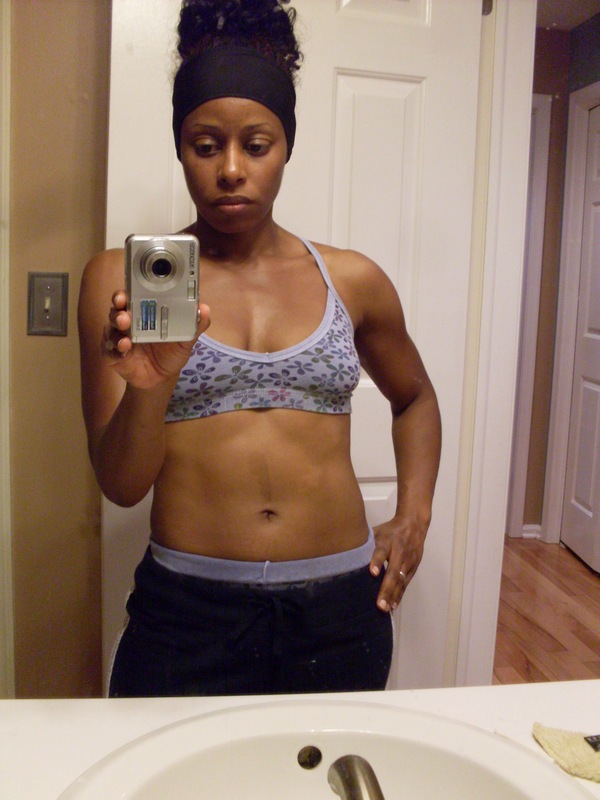 Lauren Brooks, Bob Harper or Angie Miller Kettlebell routine (2 days a week). 10 minute Abs of Steel routine (5-6 days a week). 1 rounded scoop of Green Vibrance in almond milk or in a green smoothie. Breakfast (btwn 6-8 am) – 1/2 c. oatmeal or cooked Grapenuts with 1/2 cup blueberries (Dole frozen/thawed) OR the aforementioned green smoothie; 1 cup of instant coffee w/2 packs of Truvia, 1 tsp agave, a little powdered skim milk or almond milk. Lunch (approx 12:30-1) – Lean Cuisine (chicken/turkey/fish with rice or potatoes) w/added vegetables (spinach, broccoli or sugar snap snow peas) and a piece of fruit (apple, orange, banana, etc.). Snack (approx. 5 pm) – Organic baby food (Ella’s Kitchen or HappyBaby/Tot). Dinner (approx 8 pm) – Lean Cuisine (chicken, turkey or fish w/rice, potatoes, whole wheat or orzo pasta) w/added vegetables (spinach, broccoli or sugar snap snow peas); fruit on occasions. May also incorporate Whey Protein Isolate (WPI) Shake (Nectar Strawberry Mousse) as a post-workout recovery drink. In bed by 11 pm Sun-Thursday (this is crucial)!!! Need to get back to this!! Rewards: Finding THE BALANCE!! Oh, and to feel confident rocking the bikinis I purchased last year (and have yet to wear) on my vacation in Cancun!! Improved health and well being!! There’s nothing like feeling strong and energized! Follow me online: Well … you know. LOL!! L E T ‘ S G E T G R O W I N G ! ! ! Awesome and know that you CAN and WILL do it. I love our little FB group and making this healthy living a lifestyle choice. I love it. And I need those abs in my life!! Working on it. I need those abs in MY life too Christabel!! LOL!!! But, you are going to get there soon, I know! You go hard and are so inspiring!! Thanks lady:)!! umm that 11pm bedtime needs to be 10! i know its hard but you need that full 8 maybe more. i think my full head is your nape length LOL. $99 for a dome dryer is too much. I have a super wonderful one ( i think it’s con air) that i paid like $49 Hit up amazon. LMBO!! Michelle, you are too funny about the nape hair!! As to bedtime, I’m okay with 7 hours … sometimes, I think 8 hours makes me more groggy when I wake up whereas I naturally awaken at about 7 hours of sleep. As to the dryer, I’m talking about a dryer on a portable stand. Is that the kind you mean? Or, are you referring to a tabletop model? That’s the thing! I don’t know where I would store it! The great place would be the linen closet, I think. But, the vacuum is in there! But, I always manage to find a place to stash things ;)! This definitely just kicked in my motivation! I started working out again 2 weeks ago and I’ve already slacked on my routine. 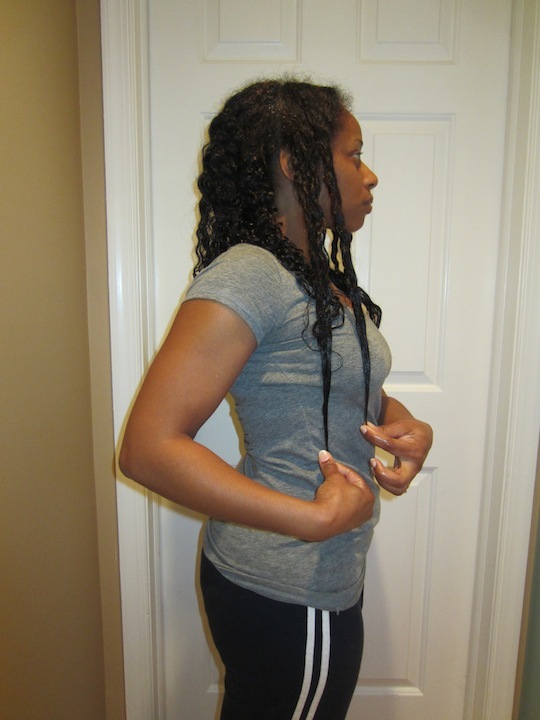 Planning to drop 10-15 lbs by August and hopefully grow my hair to BSL. Thanks for sharing! Thanks Danitra and you’re welcome:)! Awwww, thanks Marsha. Yeah, the exercise and eating right definitely help with the exhausted feeling!! Oh wow!! You’re having a full hysterectomy? Good luck and God Bless. But, I’ll be honest, you might want to start doing some ab/core strengthening exercises now (if you can), as they’ll make recovery easier (that is, if they’re doing a bikini line incision). I had fibroids removed years ago and it took years for me not to feel the tightness at the incision point and regain my core strength. So, if you can do abs and you are having that type of incision, it may help with the recovery time. Oh wait … I forgot!! I’m talking to a nurse!! LOL!! Thanks…I’m having a partial Hysterectomy. The ovaries will remain. It will be done Laporoscopically. No bikini cut, only small incisions the diameter of a number 2 pencil. Wow, didn’t know you had fibroids as well. How long ago was it, and did they or it grow back? Laporoscopically is great! That’s nice! Yes, I had the surgery around 11 years ago now. I’ve had a little regrowth, but only 1, I think. When I had to have the myomectomy, my Gyn said she stopped counting at 32 removed during the surgery … yeah, it was that bad. I couldn’t even lay on my stomach without pressure and constantly had the painful urgency to run to ladies room. But, I’ve been pretty good ever since. Again, just 1 (maybe 2) and small. I swear to this day that it was due to stimulants I took when I was bodybuilding to keep energized for my workouts. Wow, you had a lot. I don’t think I have quite that much, however the ones I do have are seriously large. I used to make urgent and frequent trips to the restroom. I experienced dyspareunia, a large abdomen, and other unmentionable symptoms. Wow…the stimulants contributed them? Interesting, I never heard of that before. Shelli, your body must be like mine. I can’t take any time off or it just holds weight. Mrs.DJ, if I wasn’t a binger (don’t let me get around cake or cookies), it probably wouldn’t be so bad! But, for sure, I have to exercise and eat right to maintain 120 lbs. I can’t just eat right or just exercise and maintain … though, maybe I’m wrong, because I don’t know if I’ve ever continued to eat right, but not exercise. It’s like, either I do both or neither!! So bad:(. Good Luck to the listed and non listed GOC participants!!!! Can’t wait to read all the updates!!! I was waylaid on my way to joining by life in general. I will be one of them ladies participating in ‘stealth mode’. Yea for stealth mode participation ;)!! Wishing you all my best in achieving your goals! You can do it!!! 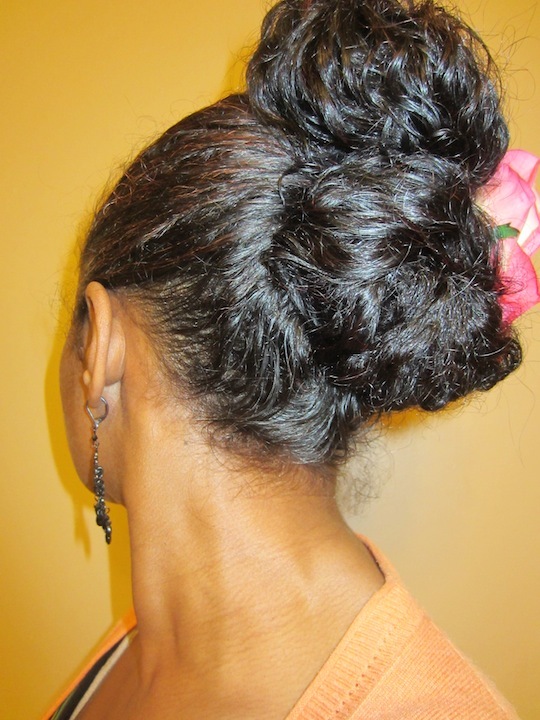 I’m new to your blog but I followed your henna routine on curlynikki. I’m newly natural 3 months post BC. Thanks for the detailed regimen. I want to grow my hair out and would appreciate any good to do just that. How do I join the GOC? Hi Keisha, you can be an “At Home” player by sending me a GOC submission following the instructions listed under the GOC tab. Thank you! Awesome! What is your hair regime pre and post work to protect your hair?